There are several good books on poker tells out there, and several good books on poker psychology that are available. McKenna attempts to bring both topics together into a single book, which at least on its face would seem to be a worthwhile project if done properly. There’s no question that there is an element of psychology in poker tells, where you look to classify players according to what you can gather from their psychological makeup. The more you can come to understand about a player, the more potential there is to accurately read them based upon their behavior. This book presumes a pretty good knowledge of tells, and it would be a good idea to read one or more books on tells before looking to tackle this one. In particular, you will have had to have read Mike Caro’s classic book on tells as it’s referenced often in this one. It‘s actually a good thing that this book presumes a good basic knowledge of poker tells, as the book promises information beyond tells, so we wouldn’t expect that it would be a primer on tells themselves, and would instead look to take us beyond this material. After a rather long discussion of psychology in general, McKenna finally gets into the meat of the book, where he sets out 6 different personality types and offers advice on how to play against them. However, even this part was disappointing. I suppose there is some merit in some of his advice, but readers who are expecting to have this book add a significant amount to their understanding of poker tells won’t be left too invigorated. Given that McKenna’s other two poker books, Beyond Bluffs and Beyond Traps are among the very worst poker books ever written, I wasn’t surprised that this book wasn’t that informative, although to be honest it isn’t as bad as his other two. I didn’t feel like I totally wasted my money on this one like I did on the other two, and at the very least this project is more on the unique side, rather than just looking to provide horrible advice on topics that have been dealt with much more effectively by other poker authors. At least some of the advice here is good, once he gets into the meta advice part of the book, which is what I was hoping for when I bought it. For instance, things like observing a person’s general characteristics, like a passive and laid back personality, who suddenly starts acting more assertively, which can often indicate that a player is bluffing. 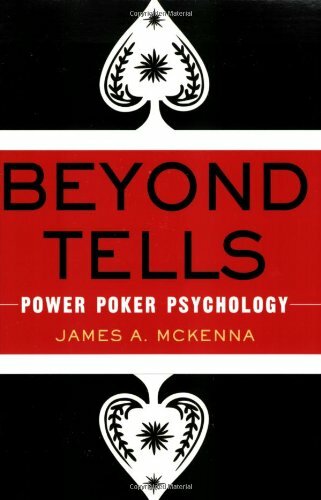 Overall, if you play live poker, there’s a limited amount of good books on tells, so even ones of a lesser quality like this one are probably worth reading, especially since McKenna does take readers off the beaten path and into the world of the psychology of tells. Just don’t be expected to be blown away here, and be willing to settle for some good tidbits here and there, and you won’t be too disappointed.